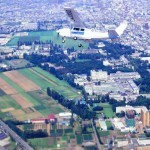 http://www.sapporo-park.or.jp/moere/Moerenuma Park is the 189 hectares of his last and best work. It was selected as grand prize winner of the Japanese Good Design Award in 2002. The emphasis of the park is Glass Pyramid (called “HIDAMARI” meaning “sunny place”), Moere Mountain, Play Mountain and Sea Fountain. HIDAMARI is a symbol of the park which was designed by Isamu Noguchi as “an entire park that in essence is a single masterpiece itself”. A glass pyramid designed as a light object with a clear surface. There are shops, restaurants, galleries and an observation deck inside. The 62 meters high Moere Mountain function as a landmark as the only mountain in the northeast in Sapporo. You can climb up from 3 directions and 5 routes. The top of the mountain commands a panoramic view of Sapporo . You can ski and ride on a sled during the winter. Play Mountain retains some of its old stone structure. If you climb up this slope, you can enjoy the grand view amid a breeze. There are playgrounds called Forest of Cherry Blossoms where children play, ride, sit on and touch his sculptures. Their shapes are beautiful and are called Play Sculptures. There are many designs which have fascinating forms all over the park. If you visit there for the first time, you will be surprised by its size. It is only one space in Japan where people can relax and enjoy riding a bike, climbing up the mountain, looking at the view and laying down. 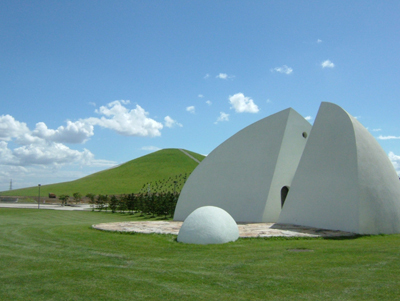 You can feel the works of “Isamu Noguchi who carved the earth” with all your senses.